Summer has arrived. Here in Tennessee, the heat is in full swing and I’ve noticed all my friends around the country have begun posting pictures of their adventures in the sun. Hop on the summer train and join in the fun with these 8 ways to get outside and use summer for your health benefit! The weather is gorgeous, why sit in your car. Where can you walk to that you normally drive to? Can you walk to ___________? Fill in the blank, maybe it’s work, the grocery store, around the block after dinner, during your lunch break. Maybe it’s all the above! Whatever works for you, incorporate more walking into your day. In fact, even make it a competition! Get a Fitbit! Compete with your family and friends. Be my friend. Having a Fitbit is like playing a video game that improves your health and the only way to win is to get outside and get walking! After you try that walking thing, start running. You don’t have to go far, just go around the block. Maybe the next time try running a mile. You don’t have to go far, but give it a try. It in’t so bad. Try doing it first thing in the morning! Getting your heart rate up can wake you up better than drinking a cup of coffee. Many people talk about running one day. Make this summer the time that you start. The hardest part is putting your shoes on and stepping outside! The number one excuse I get as a personal trainer is not having enough time to exercise. During the summer you can kill 2 birds with one stone. 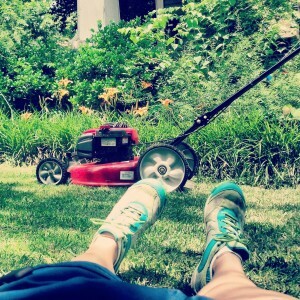 Household chores like washing the car and mowing the lawn burn calories! 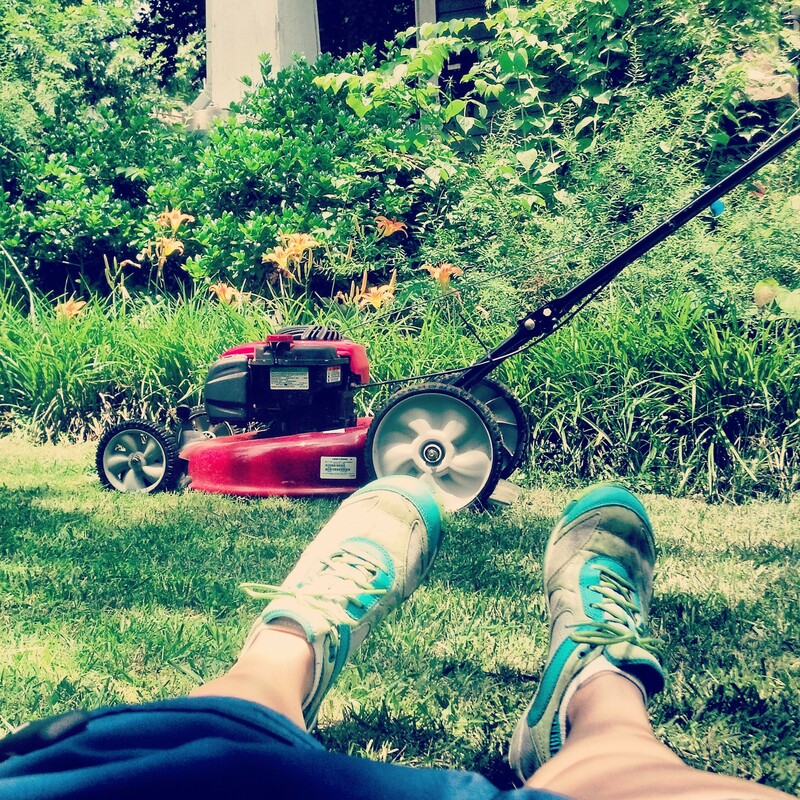 Spend an afternoon in the yard and you can burn over 500 calories while getting a tan at the same time! Answer emails with your mobile. Write that presentation on your laptop. Head to a local park, find a quiet spot in the shade. Get some work done outside. Get some fresh air. It’s good for your brain. It will help you think clearer and more efficiently. Find a pool and start doing laps! If you’ve never really learned how to swim, take a swimming lesson! Swimming is a great way to burn some killer calories, without pounding your joints. Find an outdoor pool and you can burn fat, tone your muscles, and get a great tan all at once! If you live in most areas of the country, being outside is like stepping into a hot yoga studio. Take advantage of one of your local parks. Set up your Yoga Mat. Play around with the yoga postures you know. If you do Bikram you know what you need to do. If you practice vinyasa or power yoga, play around with whatever feels good to your body. Every yoga teacher says, “you are your own best teacher.” Give this a try. Your body will steer you into the postures you need to do. If you aren’t familar with yoga just sit down and focus on breathing deeply. Even 15-30 min clearing your mind can make the rest of your day better! Find a book that will help you improve your fitness. Then read it this summer. In fact take it outside, lay in the sun for 15 min once a day and work your way through your book. There are all kinds of books on fitness. If you never tried yoga pick up Women’s Health Big Book of Yoga. It has some great step by step tips to develop a beginning yoga practice and understanding. Get motivated for your run with I run, Therefore I am–NUTS! Learn more about the food you put in your mouth with the Smarter Science of Slim. Get motivated to deepen your yoga practice with Hell Bent Benjamin Lorr’s personal account through Jedi Fight Club and Bikram Yoga Teacher Training. Take some time each sunny day to learn how to keep yourself healthier year round! Reading about fitness makes your more motivated to make fit decisions and be active! Venture outside of your normal grocery store and visit your city’s local farmer market. You can’t get produce any more fresh than what’s found at Farmer’s Markets. You will see produce you don’t normally see. Pick a veggie you’ve never eaten before and experiment with a new recipe. Just like it’s important to vary your physical activity, mixing up the food you eat keeps your body burning fuel more efficiently. Different veggies pack different nutrient loads. If you always stick to the same ones, you may be missing out on some important vitamins and minerals! Being healthy starts with spending more time outside. Take advantage of the sun and warm weather. Try to get outside and use the summer for your health benefit in one way or another each day!